Julie feels fortunate to be living in Western North Carolina and working to protect one of the most beautiful and ecologically diverse regions in our country. Julie came to MountainTrue in June 2008 from Atlanta. In 2015, she was elected to Asheville’s City Council after serving for many years on the City’s Multi-Modal Commission and Transit Committee. In 2011, she was appointed by Governor Bev Perdue to the Mountain Resources Commission, where she served until the legislature dissolved the Commission in 2013. She served on the North Carolina Conservation Network board for six years, chairing it for two. 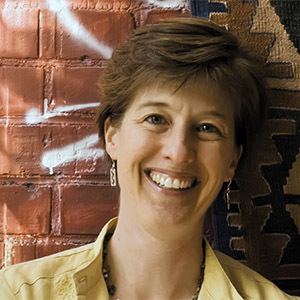 From 2003 to early-2008, she was Vice President and General Counsel for the Georgia Conservancy, a statewide environmental advocacy organization. In that role, she worked on policy issues in the areas of air and water quality, land conservation, growth management, and coastal conservation. Prior to the Conservancy, she directed the Turner Environmental Law Clinic at Emory University School of Law where she represented environmental groups, civic associations, and individuals in public interest environmental law cases. She has also practiced environmental law with the firm of Kilpatrick Stockton. Before attending law school, she worked for Amnesty International and other non-profit organizations dedicated to human rights, community service, and social justice. She is a graduate of Leadership Asheville, the Institute for Georgia Environmental Leadership, and Leadership Atlanta. She received her undergraduate degree in religion from Davidson College in 1989 and her law degree in 1996 from Emory University School of Law, where she was a Woodruff Fellow.